Some of the projects Denovo Building Services Ltd have supported. 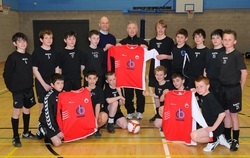 Stuart Mathieson presents Stirling Albion Youth Team with new strips. In 2012 through the enthusiasm of Adam at Inglis Vet we were introduced to this project. The aim to help build and set up a Veterinary Surgery in Lilongwe and make the LSPCA (Lilongwe Society for the Prevention of Cruelty to Animals) sustainable in the longer term. Private clients (often ex-pats) will pay for the treatment of their pet and the money raised will go towards supporting the charitable work the LSPCA do in the community to improve the welfare of animals . In May 2012 Adam, along with an engineer and 2 of the nurses from Ingilis Veterinary Practice headed out to Lilongwe for 9 days to fit out and train a vet surgery in Lilongwe, Malawi. Denovo provided some of the tools and materials to fit and maintain the equipment. If you'd like to learn more about the project google www.lilongwespca.org.